At Centennial Seeds in Lafayette, Colo., Ben Holmes is testing hemp varieties. Holmes made his name distributing and breeding strains of medical and recreational marijuana, but recently has become a prominent figure in Colorado’s fledgling hemp industry. A handful of farmers are set to plant the country’s first hemp crop in decades, despite federal regulations that tightly restrict the plant’s cultivation. KUNC and Harvest Public Media's Luke Runyon explores Colorado's hemp revival. Proponents of industrial hemp say it’s one of the most misunderstood plants in the world. It’s related to its far more controversial cousin, marijuana, but lacks the THC that gives marijuana its psychedelic properties. Hemp is grown for its fibers, seeds and oils all over the world, but has been a controlled substance in the U.S. for decades. One of dozens of growers approved by Colorado to plant hemp, Jim Denny is putting in about an acre. 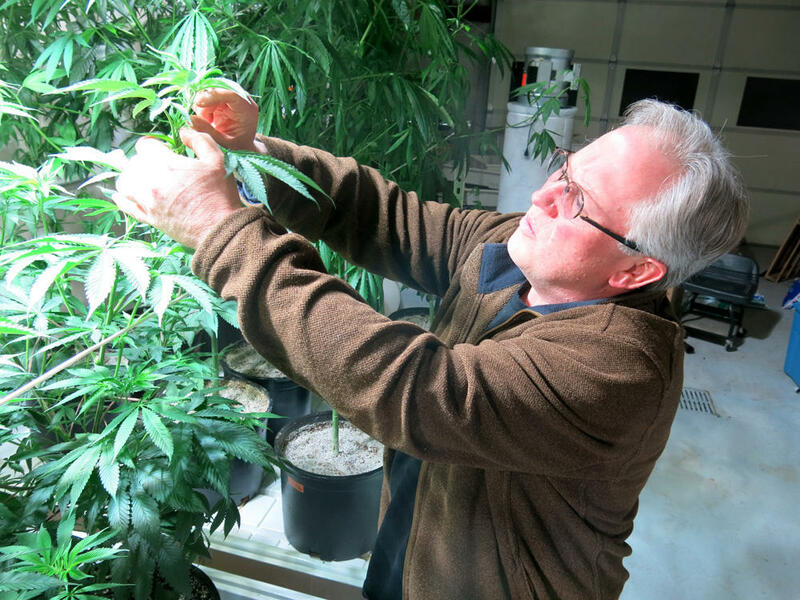 He starts the plants in his Brighton, Colo., indoor grow house. The first federal law mentioning hemp came in 1937. Congress discouraged the high THC varieties of cannabis, like marijuana, while exempting farmers who grew the crop for industrial uses like fiber and seed. It enjoyed a short resurgence during World War II, when the federal government actually promoted the crop, petering off in the 1950s. The Controlled Substances Act of 1970 put the current kibosh on the plant. It required farmers apply for a federal permit before growing it. No commercial permits have been granted since then. But in a historic move, the 2014 farm bill allowed hemp cultivation in areas where state laws have legalized the crop. Kentucky, California and Colorado are among states that have welcomed its return. Currently 12 states have legislation on the books that would allow cultivation of hemp as laid out in the recent Farm Bill. In Colorado, where voters approved both recreational marijuana and industrial hemp in 2012, state rules are now guiding farmers interested in planting hemp. 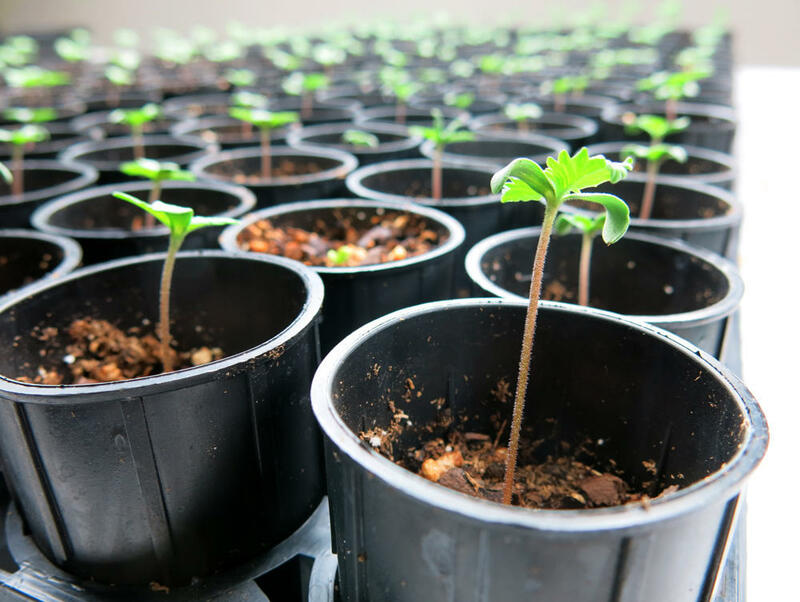 More than four dozen growers have been approved to grow the plant, and have applied for the right to grow some 1,600 acres of this year. One of those growers, Jim Denny, is putting in just under an acre. 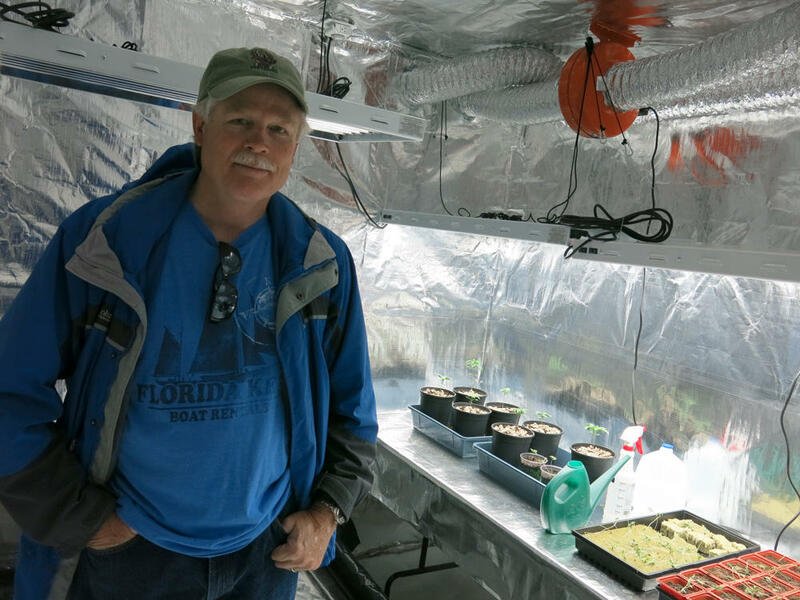 On a windy morning at his home in Brighton, Colo., a small town just outside Denver, Denny showed off his backyard garden, soon to be tilled for hemp planting. Hemp proponents hail it as a super crop, one that can make U.S. farmers lots of money. Hemp seeds, packed with protein, are increasingly showing up in foods – shoppers can pick up processed hemp seeds at their local Kroger or Costco or Whole Foods. The plant’s fibers can be turned into everything from clothing to rope to car interiors. These small hemp plant seedlings in Ben Holmes’ Lafayette, Colo. warehouse should grow into stalks more than 10-feet-high in about 50 days. For all the potential, a few bottlenecks are keeping hemp from totally taking off, snared by the plant’s federal label as a controlled substance. It’s still illegal to import viable seed, any seed sold has to be sterile. That means despite its growing popularity, hemp seed is scarce. Growers like Denny are paying upwards of an incredible $5 or $10 per seed this year. Those who have hemp seed on hand are suddenly very, very popular. "The hand-to-hand trading of hemp seed is really a demonstration of little there is and how desperate people are for seed. They're buying them one seed at a time, one seedling at a time,” said Ben Holmes, owner of Centennial Seeds, a seed distributor in Lafayette, Colo.
Holmes made his name distributing and breeding strains of medical and recreational marijuana, but recently has become a prominent figure in the state’s fledgling hemp industry. In his warehouse, emerald-colored hemp plants tower at 10-feet tall. He’s testing different varieties, some grown for their sturdy fibers, others for their buttery oils. Even though Holmes is well-situated to sell seed at some point, this year he doesn’t have enough to go around. Demand is far outpacing supply. “I get calls every day of every week of people who want to get into the hemp business and when I let them know the seed isn’t available, they really are sort of lost,” Holmes said. Ask this year’s crop of hemp farmers where they got their seed and you’ll usually be met with silence. Or cryptic explanations. Many people seem to know “A friend of a friend of a friend.” Because hemp isn’t quite legal nationwide, even Holmes said he had to acquire some of his seed through nefarious means. “It would just show up in the mail or by FedEx or someone would come to my office and say, ‘I’m a friend of so-and-so from the Czech Republic and he asked me to give you this,’ and little bits of seed would come my way,” Holmes said, with a smile. Most large-scale row crop farmers, the ones with the capital and land needed to launch a hemp industry, aren’t looking for that level of intrigue when purchasing seed. That’s why this year’s hemp planting – not just in Colorado, but in Kentucky too – will likely be modestly sized. Not a lot is known about how the plant will perform in different climates, and which varieties will yield best for seed and which for fiber. Plus, current state rules forbid growers from exporting any part that could be used to grow a new plant, so any hemp growing in Colorado has to be processed in Colorado. “The infrastructure in Colorado is still pretty limited. And we’re not quite sure how that’s going to develop over the next few months,” said Ron Carleton, deputy commissioner for the Colorado Department of Agriculture. Without a ton of businesses in the state processing hemp into food or fiber, hemp farmers could be left with a harvest they can’t move over Colorado’s borders. “So if you do cultivate hemp in any significant way will there be a market? Will you be able to sell it? And if not, then what?” Carleton said many farmers are asking. All those unanswered questions haven’t deterred growers like Jim Denny. He’s fully aware his crop is going into the ground with plenty of uncertainty. But he’s confident that in five or ten years, he’ll be part of a thriving class of hemp growers. “The one thing that legitimized this right here, and the reason I’m even growing this here, is the fact that they recognized what hemp was and they defined it, because they put it in the Farm Bill,” Denny said. With signals like that from Congress and the federal government, it may not be long before some of America’s amber waves of grain get a little greener. Aspiring hemp growers are stuck in a tricky gray area these days. While voters in some states, like Colorado, have given the go-ahead to growing and processing the plant, a blanket ban still exists at the federal level.